Have you ever dreamt of visiting either Canada or the United States? Well, we have some amazing news for you. VisaPlace is happy to announce an exciting new contest! 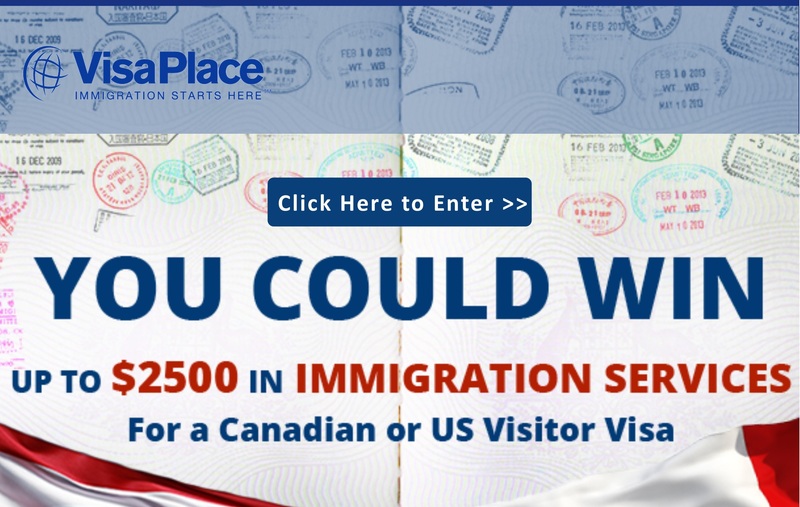 Starting in December and ending December 30th, 2015, you can enter for a chance to win up to $2500 in immigration services for a Canadian or US Visitor visa. Show us what you would do while visiting Canada or the US by adding a photo and you could win $2,500 CAD in immigration services for a Canadian or US Visitor Visa. *If you are found eligible for a visitor’s visa, we will handle your case and offer you up to a $2500 discount off all fees. And if you do not qualify, we will donate $1000 to the charity of your choice! *Send us your submissions before December 30, 2015! The winner will be the individual who provides us with the most compelling picture + had the most social shares on their story. So be as creative as you can! Deadline for contest submissions is Dec 30, 2015. The individual who provides us with the most creative submission based on our own evaluation will be the winner. The announcement of the winner will take place December 31st 2015. The contest is ONLY applicable to new clients of VisaPlace and/or Niren & Associates. Must be 18 years of age or older to enter. By participating, contestants acknowledge that posting their stories on Facebook is publicly disclosing their own stories and Niren & Associates nor VisaPlace you are waiving your right to confidentiality and we not responsible for maintaining privacy and such information once submitted and such material is therefore exempt from solicitor client privilege and no solicitor client relationship is formed. The prize is NOT payable to the winner as cash. Niren & Associates will evaluate the visa eligibility of the person who is selected in the draw before declaring them the winner of the contest. Niren and Associates has the right to modify the conditions of the contest or terminate it at any time without notice. There is no guarantee of a successful application. The winner will still need to pay any applicable government fees. Approximately about $200 with a visitor visa. Don’t allow your chance to experience either Canada or the United States pass you by. Visit our VisaPlace Contest page today and enter to win!